The client has very unique and interesting requirement in which they need a customization to auto update the invoice date whenever they are going to create the Invoice from the Sales Order. Client has a grocery shop and most of customer has purchased the items based on their credit basis and they paid the amount after some specific time like end of the month. So client has not able to generate sales invoice on the time of Sales order generated, therefore client need the functionality to update invoice date as a current date whenever they generate the invoice from those old sales order which is customer were purchased within month. 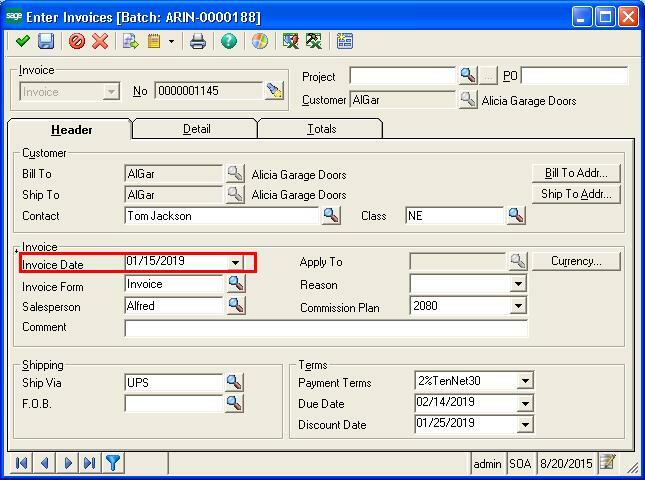 In Sage 500, the Sales order has been generated the shipment to generate the AR invoice in which they are updating the order date to invoice date on the Invoice entry screen. Greytrix has taken the initiative to develop this customization by modifying the existing process of invoice generation process in the Sage 500. They have incorporate the functionality in the invoice generation process so whenever Client has been select the old or new sales order to generate the invoice our customization will automatically update the current date as Invoice date on the Invoice. To see the effect of this customization, you need to create the Sales order on the Sage 500 and need to have generated the shipment based on the sales order. Once you have generated the shipment, this shipment you can select in the “Process invoice” screens.